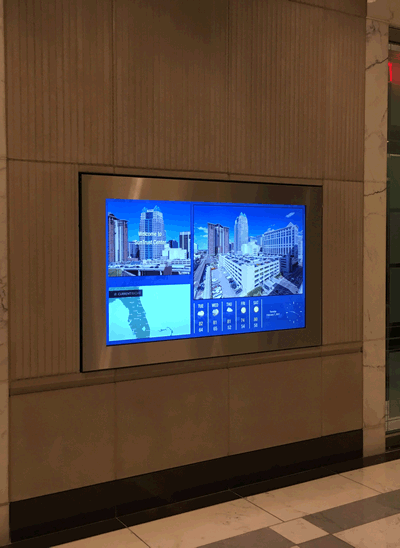 AlivePromo > News > AlivePromo integrates directories into Orlando’s tallest office tower. February 14, 2017 – AlivePromo integrates directories into Orlando’s tallest office tower. 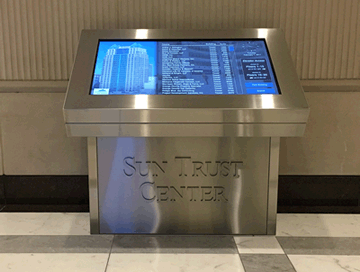 AlivePromo, Inc. in Minneapolis, Minnesota, a long time leading provider of digital display solutions for buildings and properties, recently finished a digital integration project at the SunTrust Tower in downtown Orlando, Florida. Considered the marquee building in the city, the SunTrust Tower is another significant entry into AlivePromo’s project portfolio. The project included a beautiful interactive free standing stainless steel pedestal directory, and various informational screens with custom stainless frames. Both the pedestal and frames were designed just for this project. Wifi was deployed so that the property did not have to run hard wires into tough to reach stone walls.